The meaning of the name Zoey is: Life. 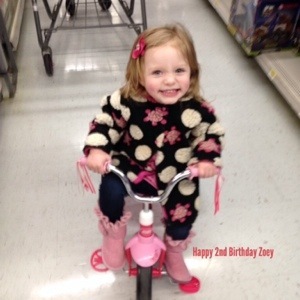 Our beautiful granddaughter Zoey celebrated her 2nd birthday yesterday. Her name suits her. She is full of life. Her giggles make you smile. When she wraps her little fingers around your hand it melts your heart. She is beginning to use her words more and more each day. It is so much fun watching her try to imitate her big brother. She will get anything she wants from her Dad and Pop Pop in the coming years. That tilt of her head and little grin will serve her well. As I watch her grow it makes me appreciate how precious and beautiful life is. We are truly blessed to have this little girl in our lives. Happy Birthday Zoey! She definitely has Pop Pops number!